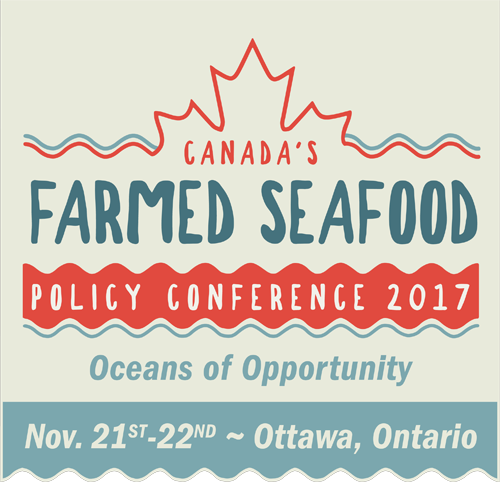 Another great Farmed Seafood Policy conference at the Westin in Ottawa (Nov 21 and 22). The Canadian Aquaculture Industry Alliance (CAIA) hosted its annual conference, attracting a range of exciting and innovating partners from across Canada’s farmed seafood supply chain and policy actors. This year’s theme, ‘Oceans of Opportunity’ featured a diverse lineup of expert speakers presenting across a number of themes about the demand for seafood, the opportunities for Canada’s industry, and Canada’s role in global leadership, research and innovation, and sustainable development of aquaculture. Among the range of topics presented, speakers sparked interest and excitement about the diversity of research and innovation within Canada and across the world. Opening keynote speaker Amy Norogratz from Aqua-Spark highlighted some of the numerous research and innovations in technology and science. Aqua-Spark is the only aquaculture-dedicated investment funds committed to sustainable aquaculture innovation and research. Only 6 years since its inception Aqua-Spark has invested in 60-80 companies across the value chain, across species and geographies around the world. In the realm of aqua feeds, they have invested in companies researching alternative protein sources. For example, these include companies such as Calysta, who is using microbes that feed off methane, and Protix, who is using insects such as black solider flies. For disease, they have invested in companies such as Proteon Pharmaceuticals which are researching how to use new strains of phages to combat fish infection. They also are investing in a number of companies creating innovations in farm operations such as Sogn Aqua who are growing halibut on land in Norway using advanced patented water recirculation technologies. Panelists discuss Canada’s role in seafood farming Innovation. From left: David McInnes, DMci Strategies (moderator), Bjørn Apeland, Steinsvik Canada; Marvyn Budd, Planet Shrimp Inc.; and Ian Carr, Cargill Aqua Nutrition. Next, Bjorn Apeland, chief executive officer from the Steinsvik Group presented a first look into the potential vision and future for aquaculture innovation in equipment, machinery and facilities. For over 60 years, Steinsvik has been producing innovative products in remote sensing, cameras, feeding systems, and monitoring software, among others, to improve the efficiency, health, and sustainability of fish farming systems. At the conference, we were fortunate to become immersed in a video presenting a potential future of aquaculture through automation, surveillance, data monitoring, etc… This video highlights their vision of how innovation can lead the industry, and highlights many of the current technologies that are even today being researched and undertaken today. Continuing with the theme of advanced technologies, Marvyn Budd of Planet Shrimp introduced us to his innovative company using the state-of-the-art technologies to culture fresh Ontario-grown indoor shrimp. This closed containment system controls almost every aspect of the species’ health, bringing the production of a local, antibiotic-free, environmentally-friendly shrimp product to Canadians. Finally, we heard from Cargill’s Ian Carr, who spoke to us about the advances in aquafeeds. Cargill is a major aqua feed company using new and different raw materials. They have major investments in state-of-the art research facilities to create innovations in health, including recovery and immunity features of feeds. Their goals are to reduce the footprint of aqua feeds and better recycle wastes during the process. These new and exciting technologies, research, and innovations continued to spark intrigue and excitement the rest of the day. These speakers, among the many presenters that followed throughout the day highlight the current opportunities already ongoing within Canada and throughout the world for the future of sustainable aquaculture. What a busy and exciting weekend at Seafood Expo North America 2017 hosted in Boston, MA (March 19-21)! The Canadian Aquaculture Industry Alliance (CAIA) exhibited at the show where we set up a live cooking station to promote Canadian farmed seafood – as well as distributed information about our producer members and their products. This show is the largest and most anticipated seafood event in North America attracting seafood buyers from retail and foodservice industries including wholesalers, distributors and importers, and exporter - and it didn’t disappoint. CAIA and its members spoke with a steady stream of visitors to the booth who expressed interest in sourcing Canadian farmed seafood. We handed out hundreds of copies of our supplier listing, member brochures - and more than 1,000 seafood samples! Boston-based chefs Scott Patnode and Mike Graffeo prepared the samples, carefully selecting seasonings and herbs to allow the delicate flavours of the seafood to really shine through. Throughout the three-day event we served Arctic Char, Mussels (Blue and Gallo), Oysters (Atlantic and Pacific), Sablefish, and Salmon (Atlantic, Chinook and Steelhead) for visitors to taste. CAIA’s Sheri Beaulieu and Ruth Salmon were on hand working alongside the chefs to distribute samples, answer questions, talk with buyers and refer member suppliers. Here Chefs Mike Graffeo (left) and Scott Patnode (right) prepare samples of Yukon-grown Arctic Char from Icy Waters Arctic Charr. The two brought great energy to the booth and were a joy to work with. Our booth featured a display case where we showcased the diversity of seafood cultivated across Canada. It really attracted the attention of show participants – many stopping to take photos of it. Maurice Daigle of Maison BeauSoleil and Brian Yip of Fanny Bay Oysters helped shuck some of their scrumptious Atlantic and Pacific Oysters for visitors to try. On the final day of the show, Chef Mike Graffeo served up a ‘Taste of Canada’ farmed seafood chowder brimming with fish and shellfish. Ongoing member support for this show is key to our success. Producers from across Canada shipped over 350 lbs of seafood for display and service. Take a moment to get to know more about them! See you all next year at the 2018 show! Calling all Boston-bound and Boston-based seafood lovers: on March 19-21, visit Canadian Aquaculture Industry Alliance at Seafood Expo North America 2017. Chef Scott Patnode will be on hand preparing delectable samples of Canadian farmed Arctic char, mussels, oysters, sablefish, salmon, and more. Our seafood tastings schedule features more than a dozen types of seafood, raw oyster bars and ‘Taste of Canada’ farmed seafood chowder. We’re excited to talk to you about the diversity seafood farmed across Canada. Check out the schedule below and plan to stop by our booth (1242) – and experience the freshness and quality for yourself. If you’re looking to go beyond pizza and dip for this year’s Super Bowl menu, look no further than fresh, nutritious seafood. This round up of recipes features fresh Canadian farmed mussels, oysters and salmon which can all be prepared in 30 minutes or less, but are different enough to surprise and impress your guests. Mussels are in-expensive and crowd-pleasing. Huddle around this aromatic, decadent dish with hunks of break in hand. Oysters are a mouth-watering delicacy. Blend their briny goodness with fresh smoky pancetta and leek to create these delectable bites. This recipe for fresh, light fish tacos is great for a crowd. It features baked Atlantic salmon with a quick and easy seasoning rub. A healthy, flavourful go-to for game day. We are excited to announce that our team has moved to a new brighter location just two blocks (300m) from our previous office in downtown Ottawa. CAIA staff spent ten years in our previous office at 116 Albert Street. Our old office served us well, and we made great memories there (and positive changes for Canadian aquaculture! ), but we couldn't be more excited about our new space. Our new location at 220 Laurier Avenue West, Suite 1650 will provide us with some additional space to suit our needs moving forward. Our other contact information such as telephone, fax and email has also remained the same. Interested in taking a tour? We’d love to have you come by and look forward to seeing you at our new office! Canadian Aquaculture Industry Alliance (CAIA) would like to thank everyone who came out to see us at Seafood Expo North America (SENA) 2016 in Boston earlier this week. The event followed last week’s release touting healthy exports for farmed seafood for 2015. Canadian seafood farmers at SENA 2016 demonstrated their eagerness to continue to strengthen and expand their markets. At our booth, we handed out our latest Canada Aquaculture Products – Supplier Contacts booklets, our Farming Seafood In Canada infographic booklets, and lots and lots of delicious Canadian farmed seafood! Thanks to everyone who came by the booth, sampled our farmed seafood and asked questions! Thank you to those CAIA members who donated their time and their products for sampling. Also, a huge thank you to Chef Scott Patnode and Mike Winchester for helping make the weekend such a success! Another Boston seafood show has passed! Seafood Expo North America is the largest seafood trade event in North America, and every March, takes place over three days in Boston. CAIA was excited to have the opportunity to showcase Canadian farmed seafood at our booth there. Check out tour photos below for a recap of this year’s activities. Ruth Salmon gets caught up with BC shellfish farmers Gordy McLellan (Mac’s Oysters) and Brian Yip (Fanny Bay Oysters). Maurice Gallant and Amédée Savoie of Maison BeauSoleil joined us at the booth to help shuck oysters. Our display case was a show stopper. Few people could resist stopping for a closer look at the variety of species on display. From a live cooking station, Chef Scott Patnode prepared so many amazing samples of various farmed finfish and shellfish including: Arctic Charr, Atlantic Salmon, Chinook Salmon, Sablefish, Steelhead Salmon, Atlantic Oysters, Blue Mussels and Pacific Oysters. We’re pleased to be working with The Conference Board of Canada and the Centre for Food in Canada (CFIC), on the 3rd Canadian Food Summit 2014: From Strategy to Action, taking place March 18-19, 2014 at the Metro Toronto Convention Centre. As a member of the Canadian Aquaculture Industry Alliance, you are able to attend the Summit at the reduced rate of $695 – use Rebate Code PRM15 when registering to receive this special rate. This major, international event will be the launch of the Canadian Food Strategy – a comprehensive, action-oriented framework that outlines a shared vision for the future of food in Canada and meets our country’s need for a long-term strategy. The emphasis of the Summit will be on leveraging opportunities and finding workable solutions – ways to make the most of our resources and talent to achieve the great economic potential of the food sector and meet the full range of Canadians’ food needs. The Summit will feature international best practices in food strategy implementation from Scotland, Australia, the UK and other leading countries who are implementing their own national strategies. Delegate engagement sessions will allow stakeholders to discover how they can collaborate on implementing the Canadian Food Strategy and help define a future Conference Board report that will measure and track the food sector’s annual progress on achieving the goals and desired outcomes outlined in the Strategy. Industry Prosperity – increasing the output and profitability of Canada’s food industry to contribute to national economic growth and our global competitiveness. Healthy Food – improving the health of food products and the diets of Canadian’s as obesity and chronic diseases become an increasing concern. Food Safety – ensuring that food safety is maintained throughout the supply chain as globalization grow. Household Food Security – improving food security to ensure that all Canadians have access to safe, affordable and nutritious food. Environmental Sustainability – sustaining the environment while increasing agricultural output as countries seek to feed their rapidly growing populations. Summit attendees will include producers; regulators; processors; retailers; governments; associations; academics; unions; advocates; independent experts; and non-profit organizations. As the agenda is finalized and speakers are announced, more information will be provided. For up to the minute information, follow #CBoCFood on Twitter. Register online today! Don’t forget to use Rebate Code PRM15 to receive the reduced rate of $695! For more information or help with your registration, please contact Emily Hayward at the Conference Board, at hayward@conferenceboard.ca or 613-526-3090 x 393. Halifax welcomes the 4th BioMarine™ Business Convention from September 9 – 12, 2013. Co-organized with the National Research Council of Canada (NRC), the convention brings together international business leaders, government representatives, scientists, academics and civil society communities to discover and share innovative solutions for advancing economic development of bio-marine business sectors. The developing program proposes business-to-business (B2B) meetings, several networking sessions, a trade show and two full days of presentations. The convention’s format is designed to encourage discussions and the sharing of information about sustainable business opportunities in marine biotechnologies, aquaculture and aquafeed, and marine natural products. Halifax welcomes the 4th BioMarine Business Convention from September 9 - 12, 2013. New to the convention this year, BioMarine™ welcomes the participation of EUREKA! The European-based network of 40-plus member countries supports market-driven R&D and innovation projects across all technological sectors in Europe and beyond. Through NRC, Canada’s national office for EUREKA, Canadian technology-intensive small and medium size enterprises (SMEs) can access technology, expertise and markets in EUREKA member countries by participating in these projects. NRC’s Industrial Research Assistance Program (IRAP) can provide direct support for eligible Canadian SMEs. For more information or to register for the 4th BioMarine™ Business Convention, click on 4th BioMarine™ Business Convention or email the organizers at Biomarine2013@nrc-cnrc.gc.ca. March is maple syrup season! One of Canada’s great contributions to the food industry, maple syrup is a favourite natural sweetener to use in cooking. To welcome the season, we’ve collected three recipes that pair this sweet delight with some of Canada’s top farmed seafood products. Try one today for a fresh, local and purely Canadian culinary experience. Place salmon portions in a shallow dish, and coat with the maple syrup mixture. Cover the dish, and marinate salmon portions in the refrigerator 30 minutes, turning over at 15 minutes. Courtesy: True North Salmon Co. Ltd. In a bowl mix mustard, salt, pepper and garlic. Add maple syrup, Balsamic vinegar, blueberry juice and oil and whisk until it emulsifies. Refrigerate for 30 minutes. (for best results prepare vinaigrette the day before. Place a mussel in each half shell then top with the vinaigrette garnish and chopped chives and lemon zest. Mix together all ingredients except trout. Marinade trout in mixture for at least 1 hour. Heat some olive oil in a large skillet. Pan sear trout, about 5-6 minutes per side, until flesh flakes easily with a fork. Remove trout from pan. Reduce heat and add reserved marinade to skillet. Simmer until thick. Pour sauce over trout and serve with caramelized red onions and roasted seasonal winter vegetables, such as butternut squash, sweet potatoes, turnip, and leeks. Slice two or three large red onions into rings, about 1/4″. Sauté in melted butter over medium-low heat until butter has thickened and onions are a rich caramel colour, about 30 minutes.